Blurring the line between “guesthouse” and “serviced apartment,” the Penguin House delivers spacious and well-equipped rooms at flashpacker-friendly rates. Your baht goes quite a bit farther here than at trendier places elsewhere in the Silom/Sathorn area, and the rooms are quite comfy for the price. The block-like five-storey building had received a fresh coat of yellow and brown paint since our last visit, also adding Flow Cafe to serve fresh coffee, beer and sandwiches on an inviting ground-floor terrace. Stepping inside, you’ll most likely be met by a round-faced man with a laid-back demeanor and friendly attitude at a reception desk punctuated by Chinese spirit statues and a yawning house cat. He speaks decent English and has a reputation for being helpful. Rooms come in two sizes and are both very similar, with the pricier versions bagging you a sofa and perhaps a small balcony. Featuring large windows, dark-orange tile floors, classy Thai woodcarvings and Thai silk on the beds, all rooms are more thoughtfully decorated than we’d expect for the price. They’re also equipped with air-con, TV, fridge, free WiFi, desk and surprisingly large bathrooms with hot-water showers partitioned in a separate area from the sink and toilet. One of the rooms we checked out smelled strongly of cigarette smoke so you might want to inspect a couple of them before committing. The air-con units looked rather old, but otherwise the rooms appeared to be well kept. Soi Sri Bamphen is a narrow street with quite a bit of traffic and the Penguin House sits directly next to it -- ask for a room at the back of the building if you’re a light sleeper. Penguin is a family-run establishment serving up rooms by the night or for longer-term stays. The nightly rate drops by 50 baht if staying for a week, by 100 baht if staying for two weeks, and by 200 baht if hanging around for a month. A key-card is required to enter a stairway that leads upstairs to the rooms. There’s no lift, so ask for a lower-floor room if you’re not looking for a workout. The location is solid if you don’t mind walking past some of the slightly seedy bars found across the way. Night owls can enter an alternate universe at nearby Wong’s Place, while early risers can go for a jog or rowboat ride in nearby Lumpini Park. Lumpini MRT station is a 10-minute walk away, and all of the food and nightlife action of the Sala Daeng area can be reached after one stop on the subway or 20 to 30 minutes on foot. 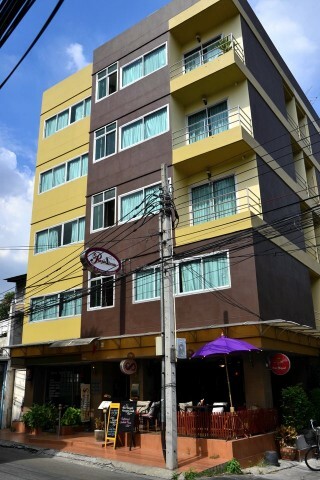 Also in the Soi Ngam Duphli area, S1 Hostel has more of a modern-industrial design, while Malaysia Hotel offers less inspiring rooms but also a decent swimming pool. Both of these offer private rooms with similar amenities and rates as at Penguin House. If you’re after a long stay option and don’t mind paying a bit more, you also might consider the Sanctuary House, situated at the end of an alley that begins across the street from Penguin.